Tulum, 멕시코의 카사 바벨 | 호스텔월드에서 예약하세요. 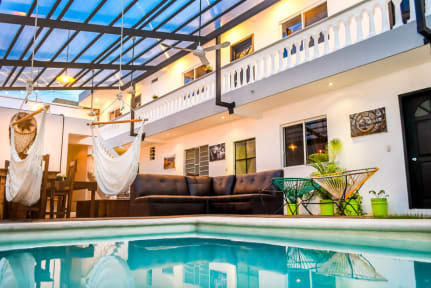 Casa Babel is situated in the center of Tulum, is a big house with nine private rooms with private bathroom, air conditioned, fan, swimming pool, common kitchenette, terrace, breakfast, hot water, reception open 24 hours per day. We will be more than pleased to receive and host you in our facilities! We are located in one of the best locations of our city. 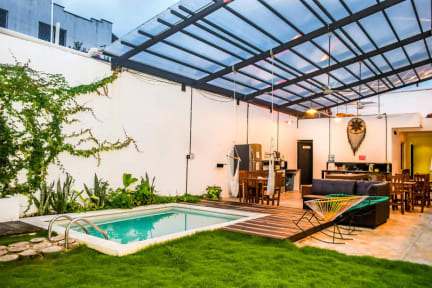 In this sense, we are near to some of the finest attractions and landmarks of our city such as Zona Arqueológica de Tulum, Parque Nacional Tulum, Tulum Sea, Edventure Tour, amongst other interesting spots of our area. We are specialized and oriented to offer private accommodation options to our guests. In this sense, our private room have different capacities and they are perfect for couples, families or groups of friends travelling together depending on what they are looking forward and the amount of people that they are. Furthermore, we have as well common areas where the guests can relax and enjoy our facilities and amenities. The cancellation policy is of 24 hours.